I am trying to implement quadtree for my Barnes-Hut algorithm implementation. I am not sure that the code I've wrote so far is good implementation - it is dirty, and tend to be slow. Of course I am also aware that the results might be correct, but I'd be glad if someone can take a look at that and give me a hints. Because the whole code is very big and also includes OpenGL visualization, I am putting here only important parts. I hope that's ok.
Because it is octree I am using box to visualize it and test if it's working correctly. Also, boundries array represents this box and this is how I am numbering corners: As for the speed I've run sample test by randomly placing new nodes and this is how time/elements plot looks like: Is it correct behavior when I am changing MAX_LEVELS value? Naming: If this is an octree, let's call it Octree rather than Quadtree! Naming: Pick a naming convention and stick with it. We have a mix of camel-case, snake-case and pascal-case for members and variables. A particularly confusing name is in for(Element* Element:this->objects), where a variable has the same name as a type. Spelling: "Boundary" and "boundaries" both need an 'a'. Prefer double to float, unless you have a demonstrated problem of storage (in this case, we might need Element to contain float members, but the octree can use a higher precision). Prefer strongly-typed constants rather than macro definitions (although I think MAX_LEVELS shouldn't be a constant at all - see below). The contains() member is a pure lookup, so should be declared const. 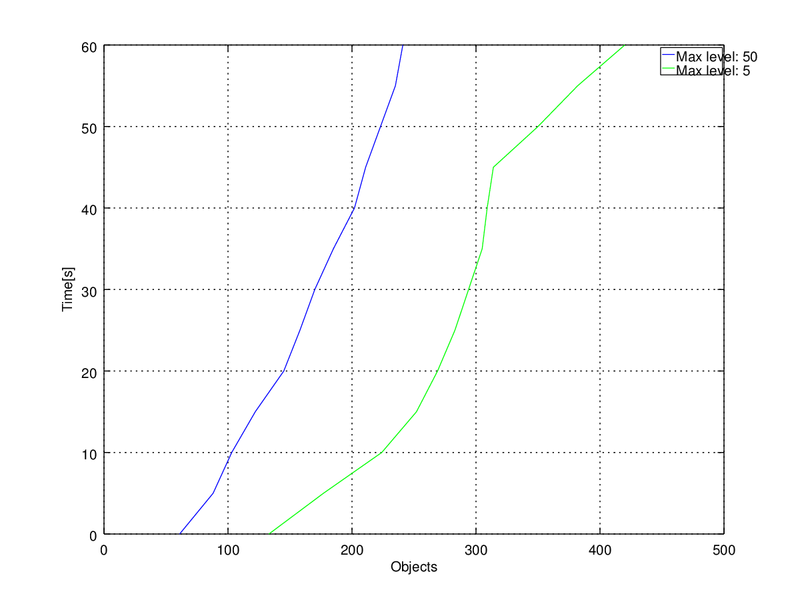 Avoid owning objects by raw pointers; instead, use smart pointers with automatic memory management. This would have been much easier to review with a working test set, using either a C++ test framework or just a simple main(). As these don't change, they can be declared const. It's also useful to know the midpoint, so we can allocate points to their quadrants. We should also have a level member, but I'll change its meaning so that it's then maximum depth permitted below this level. That means we no longer need MAX_LEVELS to tell us how deep the tree can go - it's simply specified as a property of the top node and propagated down until it reaches zero. We'll want to record the aggregate properties, but I won't actually implement the updating of these as you seem to be comfortable with that part. // Visual test - do these few points go into the right boxes? std::cout << chunk*(i+1) << " points: "
Not the answer you're looking for? Browse other questions tagged c++ algorithm or ask your own question.